The master story-teller hasn’t lost his touch. In this latest work of his, of 2009, Jeffrey Archer regales us with the wonderful story of the British mountaineer, George Mallory - a character that he builds in such a way that we cannot but admire. Our love for this protagonist will just keep increasing by each chapter. And, as readers, we become so captured and so enraptured by the glowing spirit of this determined man, that despite insurmountable odds, we want him to continue chasing his dream. We soon begin to hope - in fact, desperately hope - that he will succeed. To the end. To the very end. But, what’s George’s passion? He wants to climb and reach the pinnacles of success, in their truest sense. The snowy summits and the coarse crests. He cannot resist the Alps, and the Himalayas. But in the 1920s, when neither transportation nor communication technology could aid him - though oxygen cylinders had just made an entrance – it is a big struggle to get funds arranged, let alone climbing up the steep slopes of icy mountains. Only after mid-way through the book did I realize that it was actually the “true story” of George Mallory. So, I was tempted to do a little research on Google, and was shocked at the enormous and colossal research that the writer must have done - into the real life of George Mallory, his family and his friends. Before coming out with this work of fiction. Even though many people may know the actual end of this amazing story. The mystery behind whether he has achieved it or not, will keep you riveted to the book. The story is traced along the historical happenings of the early 1900s. We’ll see his life in the backdrop of the First World War, the freedom struggle in India, the US and New York’s rise, and the Cambridge-Oxford education. It is all very well-brought out in the truest and inimitable Jeffery Archer style. Yes. George Mallory’s is a unique story. His determination and his die-hard passion for mountaineering. His studies, his friends, his inspirations. His likes and passions. His dislikes and detests are woven very well into this captivating narrative. It is certainly a great read for all lovers of adventure stories. (But then, hee.. hee..., perhaps I am biased. 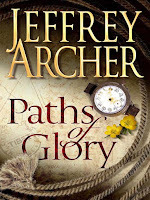 By my long-term adoration for Jeffrey Archer’s writings. I think I've read almost all his books – my first book of his being Kane and Abel, which I had read when I was just fresh out of high school in 1983. Now its 2009. And he still is very good at story-telling. I hope he’ll live long to write more).